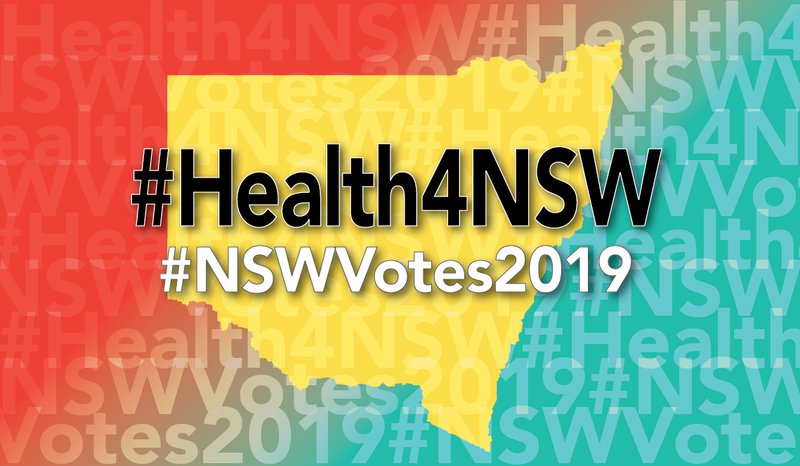 Home Global health and climate change climate change The NSW election – what’s health got to do with it? 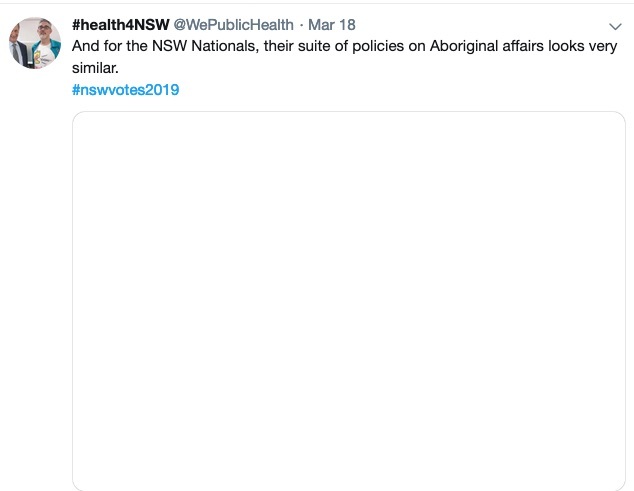 With the NSW election fast approaching, it’s difficult to find health policies that are inspirational, according to Dr Tim Senior, a GP working in Aboriginal health and a contributing editor at Croakey. 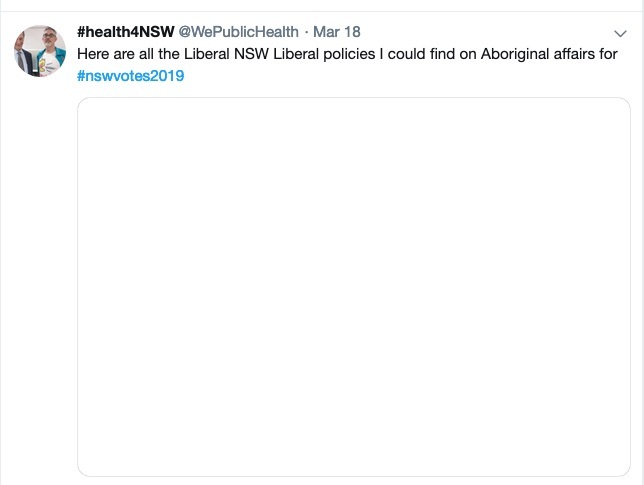 Nonetheless, as this week’s guest tweeter at @WePublicHealth, Senior has been digging deep into a wide assortment of election policies to ensure Croakey readers are well placed to understand the health decisions facing NSW voters. 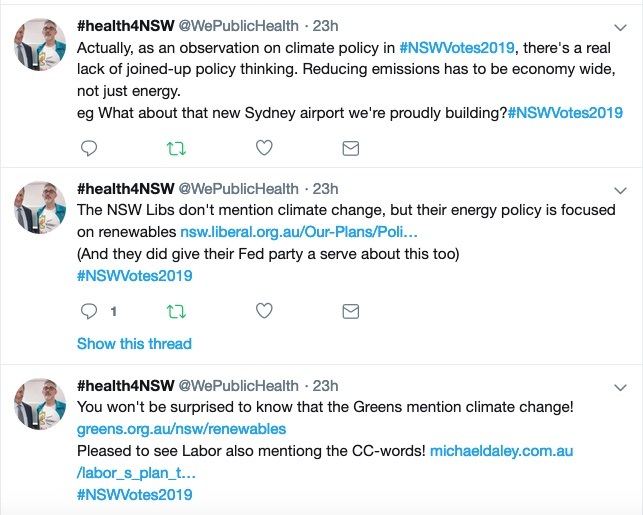 Follow him at @WePublicHealth, read his health election analysis below, and also see a sample of tweets towards the end of this post, where he describes climate change as “a dumpster fire of a policy area”. 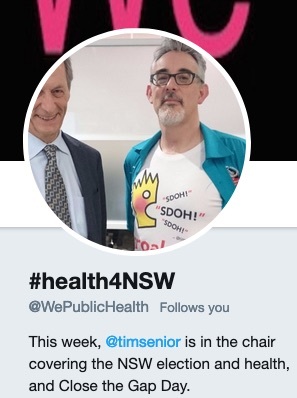 It’s exciting times for the politics nerds in NSW, for we have two elections coming up. Not only do we have the early skirmishing for a Federal election which people seem to think will be in mid-May, we’ve got the State government election this weekend. Otherwise the campaigners have been trying to cut through with arguments about sports stadiums and transport. At their launches both major parties seem to have announced big spending on things that are popular. Election commentary as a result transcribes policy announcements and spending without much analysis, while analysis focuses on the politicking and preference deals. Polls suggest a 50-50 two party preferred, suggesting a hung parliament. But, dear Croakey readers, you are more concerned with policy, not personality or politics-as-soap-opera. And there are policies in this election, driven more by pragmatism than by ideology, which, in the context of our federal politics, feels a little bit strange. The question I’m really curious about is this: what could make you change your vote? Even while we’re less rusted on to a political party, how far could you travel? What policies could decide it for you, either in favour of voting for someone, or against voting for someone? Would you vote for a minor party? Would you vote for a single-issue party, or an Independent? Do preference deals make a difference? Sometimes it’s easy. 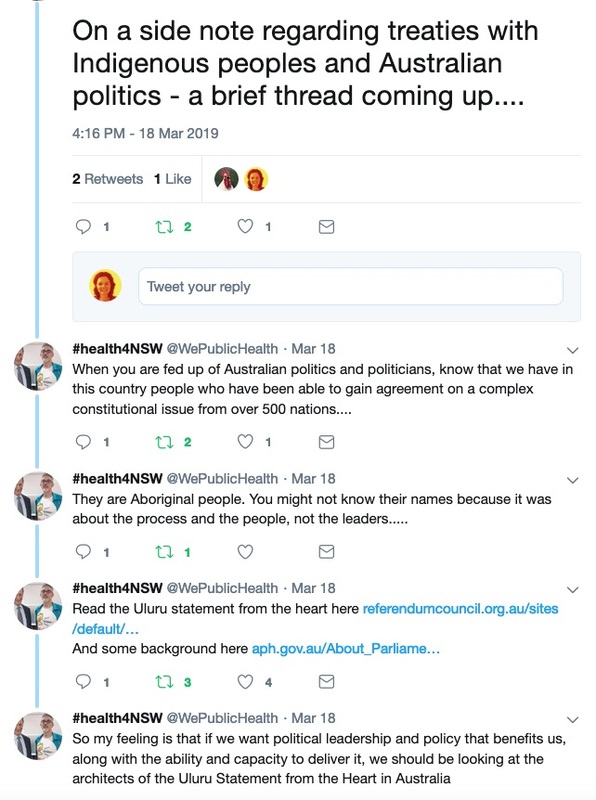 One Nation have produced such a steaming pile of a policy (DNA testing to test for Aboriginality, a combination of such racism and inaccurate racist assumptions that I can’t bring myself to link to it) that no-one should consider voting for such rubbish, or risk having their preferences end up there. I want to see policies that actively work towards health equity. 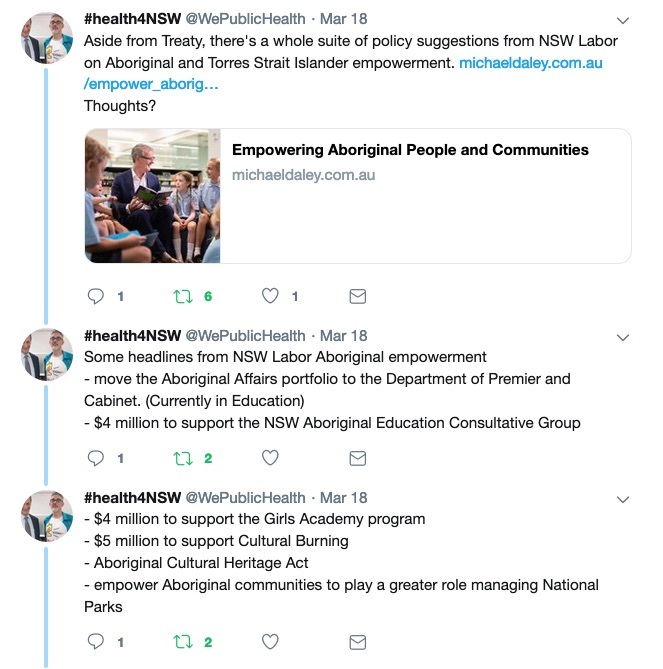 I want Aboriginal and Torres Strait Islander people and other groups we middle-aged white men consider vulnerable or hard to reach, to be actively involved in policy. And, like most Australians, I want to see action on climate change. Otherwise it’s complex. Do we take the policy statements at face value? Or does history matter? 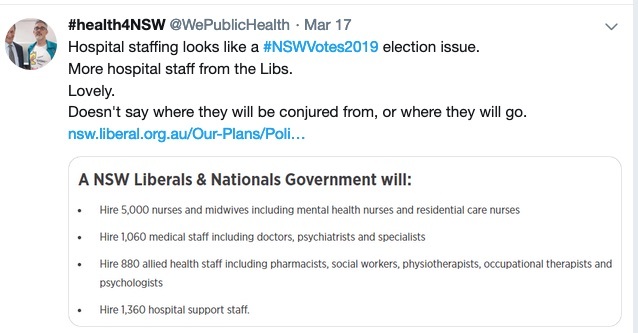 The Liberals have demonstrated it’s not clear they know how to run a hospital system, or staff it appropriately? But can we trust the Labor party, after the Eddie Obeid years? 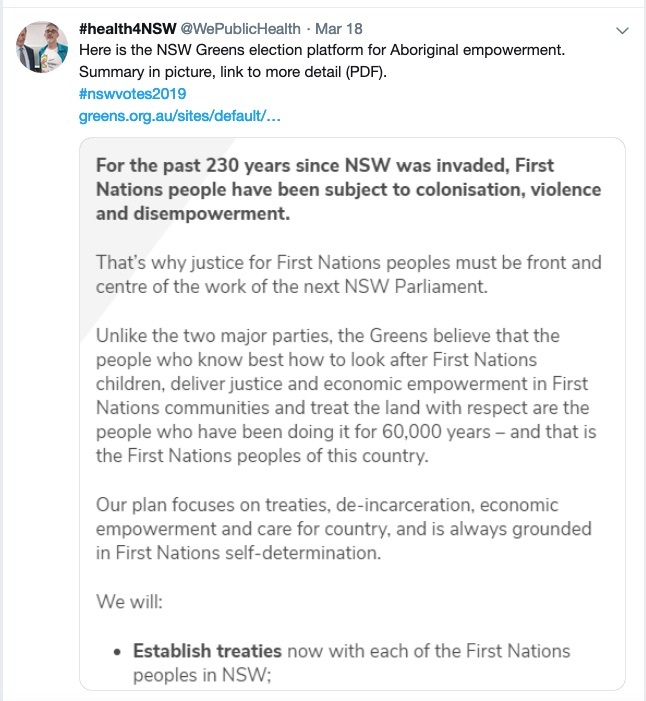 And the NSW Greens seem to be in disarray. The Guardian has a good summary of election health issues. 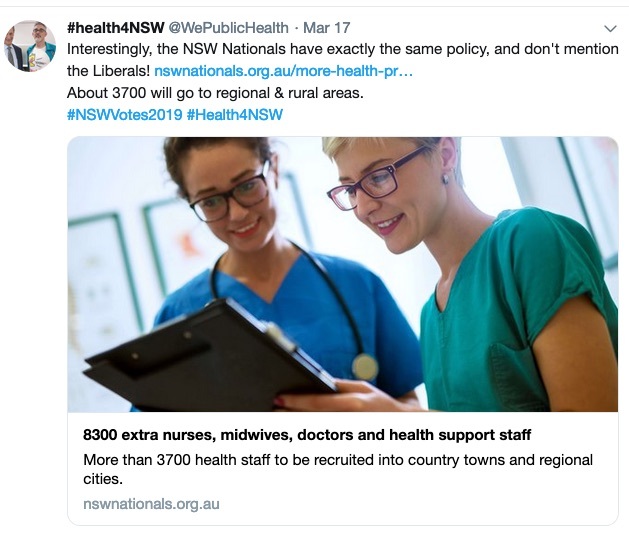 Because this is State government, which has responsibility for public hospitals, there’s an even greater pull towards the focus on “health” as just about hospitals and nothing else. Each party has competing policies that are difficult to evaluate because they are just large sounding numbers about funding and staffing numbers. These debates are welcome, but probably (and deliberately) not able to be settled. I suspect the numbers address perceptions about the hospital system, rather than specific identified patient needs. Perhaps more importantly, there are plenty of other policies in this election which will affect how healthy we are. The way we travel is a clear example, with plenty of policies on road building and rail building, and the evidence showing that public transport promotes more physical activity, then requiring everyone to travel by car. Policies that affect our relationships, keep people in poverty, support meaningful work, affect the food or the housing we have access to or provoke extremes of weather, are all likely to have impacts, for better or worse, on our health. The policies that have caught my eye so far are these below. 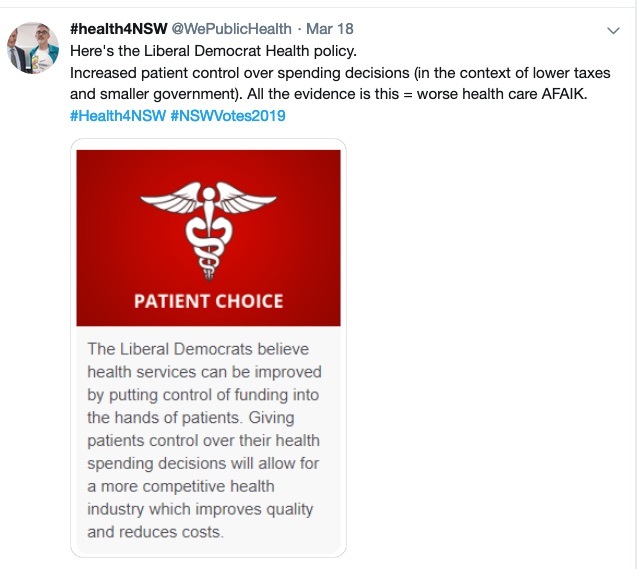 The Liberals are promising record funding for Healthy Harold, the pretend giraffe that teaches NSW children to make safer and healthier choices. It’s the very first policy on their website. The evidence of the program’s effectiveness is based on surveys of participants saying they will mostly do what they’ve just been told. This perhaps looks more like policy by nostalgia rather than what actually works, and perhaps serves as a distraction from (for example) the call for pill testing at music festivals. The Labor party policy that most caught my eye was that they will seek a treaty with Aboriginal peoples of NSW. 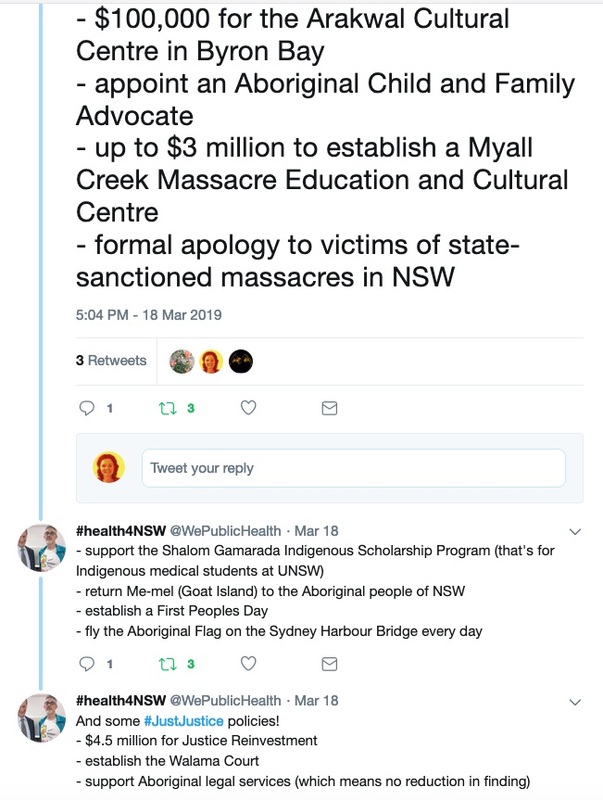 This is a potentially really good development, but it’s hard to know how serious they are when their shadow health minister, Walt Secord, has said that a relatively simple measure to create cultural spaces in NSW hospitals is “a bridge too far.” Perhaps it’s going to be a treaty negotiated by Healthy Harold. 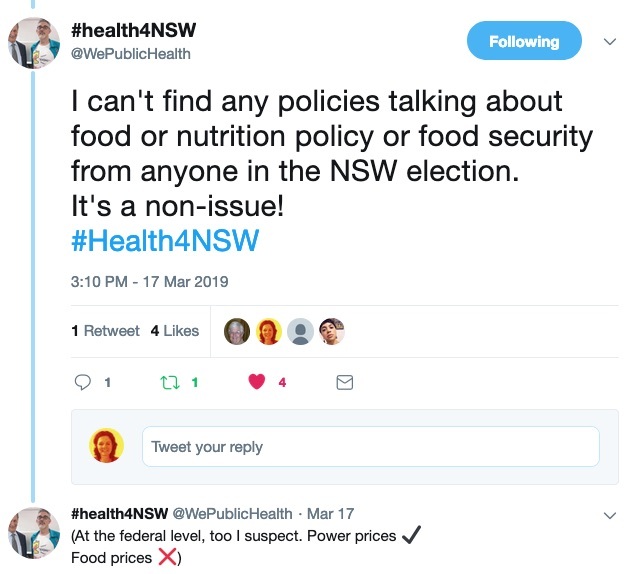 Join me this week on @WePublicHealth to look at these questions. 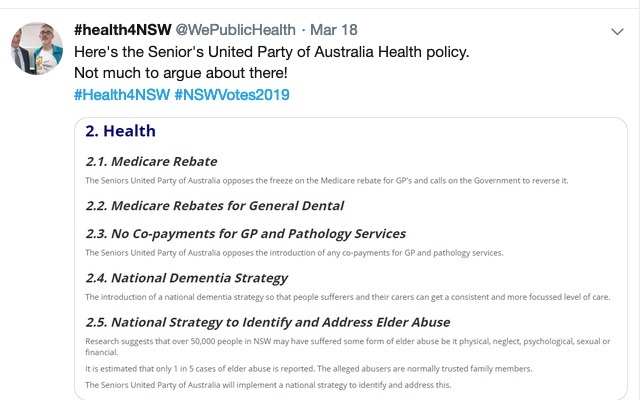 Have a look around the policies (see links below). What do you like, what don’t you like? What is missing? Do you have any Independent candidates who are saying interesting things about health? I’m hoping to have a conversation about this, with commentary and discussion on the policies and final week announcements to see what it means for your vote. Finally, if nothing else comes of this election, perhaps we could allow the coalition to argue that there is one remaining legitimate use of coal – a tiny number of very old steam trains as niche tourist attractions.